New! Soflens Daily Disposable contact lenses with Aspheric Optics. Advanced Aspheric Optics are designed to enhance vision even in low lighting conditions and helps with peripheral vision. Bausch & Lomb have completely redesigned this lens to give reduced mass for added comfort and a new material to provide resistance to build up from tear debris, thus maintaining a clean lens surface throughout the day. In addition it comes with user friendly packaging that `nest` together, allowing convenient storage. 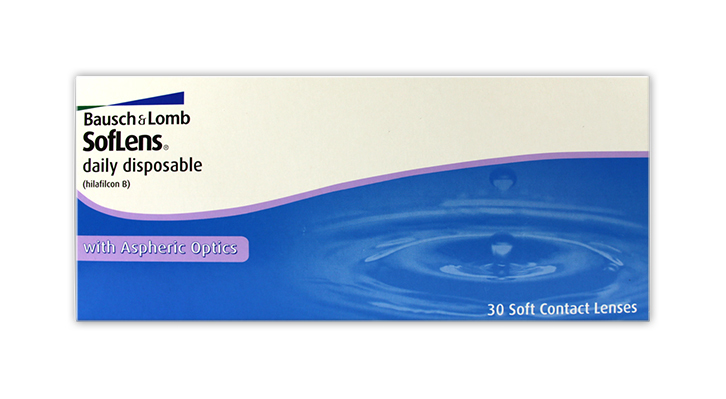 Individual lenses in buffered saline solution. Material: hilafilcon B, 59% Water. New: We have introduced a new daily lens for dry eyes and even more comfort - Crystal Aqua Daily, at a promotional limited offer price of only £5.99 / 30 lenses. A great replacement for Soflens dailies - at 1/2 the price! These daily disposables are by far the biggest and floppiest/softest lenses I tried - they are hard to put in and get stuck to your finger and once in refuse to stay in my eyes. I put these in, within a minute or so they curl up and get stuck at the top of my eye every single time without fail. I also get this effect with the Johnson & Johnson 1 Day Acuvue at times (not often) so maybe it's just my eyes that are picky. The Ciba Vision Daily and Daily Aquacomfort Plus however work every time for me so I guess use whatever fits you. dont get dry half as quickly. Had been using Specsavers and Vision Express lenses for the past 5 years, but found myself wearing glasses more often than not. These lenses were perfect for my needs, and gave me no trouble whatsoever. A good choice! These are so thick I often have to reapply another pair because immediately my eye blinks them out. They are pretty uncomfortable and i am not a fan. Will not be reordering this brand. These are the worst lenses I've ever used, more have went directly to the bin than in my eyes and on the few occasions that I have managed to get them in my eyes it has taken over 30 minutes compared to the normal minute or two. Not keen. Too fragile and spent a while trying to unravel them, when taken out of the packaging. My eyes felt quite dry with these, but they are more comfortable than the Crystal, but not as comfortable as Dailies or ProClear lenses. I think after trying and testing, I will be sticking with ProClear in future.